Friday December 14th 1894 I was busy with the cooking most of the forenoon. It was so pleasant that I thought some of the folks would be out. Will went for wood. Will Hedges came before noon and they fixed the dining room chimney. Will and I went down to Aunt Ems to the social It was a beautiful night. Charlie and Ida were down there. Saturday December 15th 1894 Will and I both were busy at odd jobs about the house all the forenoon. It was late when we got up After an early dinner we went to town. It rained all the time we were gone, got home about four oclock. After the evening work was done we read all evening. Sunday December 16th 1894 We were at home all day as it was too unpleasant to go away. We were busy with the work till noon and read in the afternoon. We had a new man come to work tonight. The wind went down at night. Monday December 17th 1894 It was more pleasant today. I was busy all the forenoon as I washed a few things with Wills help. We went to town after an early dinner. I spent the afternoon over home. Will sold six large hogs at $4.20 I got my evening work done and read in the evening. 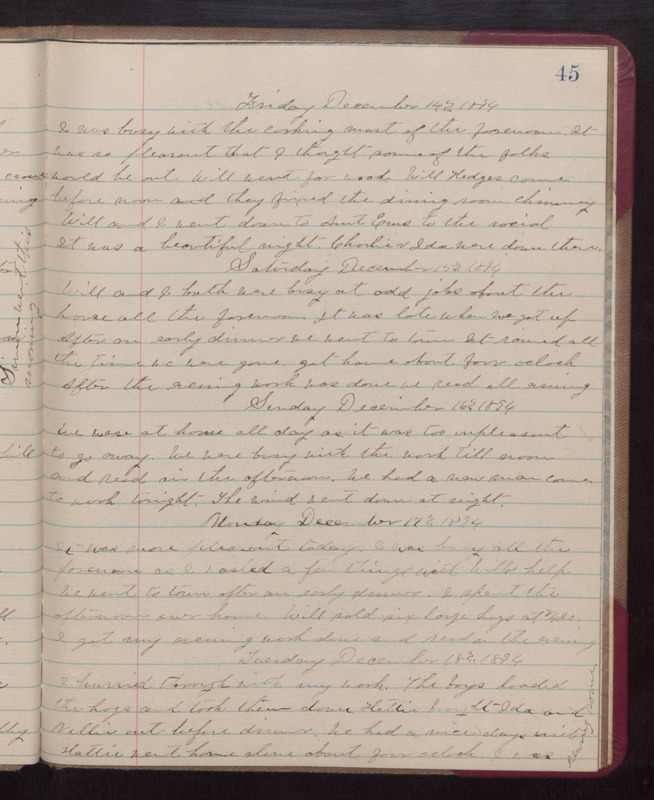 Tuesday December 18th 1894 I hurried through with my work. The boys loaded the hogs and took them down. Hattie brought Ida and Nellie out before dinner. We had a nice days visit. Hattie went home alone about four oclock. I was sewing some.